Whether they were Americans or immigrants, single or married, men who came to Heilwood generally came seeking employment in the coal industry. But how they heard about the town varies. 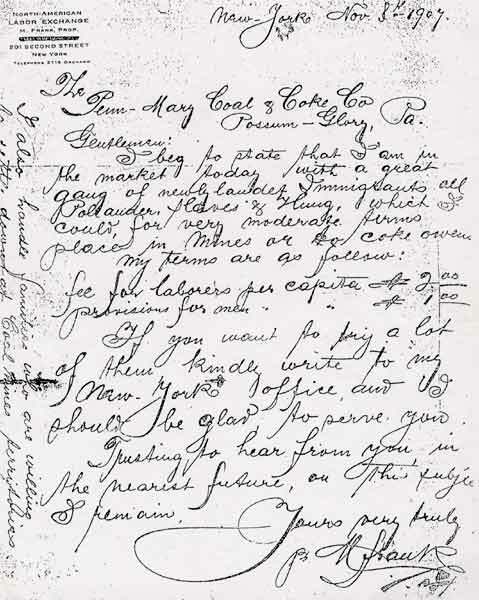 Some no doubt had letters from “fellow countrymen” already established in Heilwood, while others may have been living in a neighboring town and heard of a possible opportunity there. Still others were sent to Heilwood from labor agencies based in east coast cities like New York or Baltimore. I beg to state that I am in the market today with a great gang of newly landed immigrants, all Pollanders, Slavs, and Hungs which I could for very moderate terms place in mines or coke ovens. If you want to try a lot of them kindly write to my New York offce and I should be glad to serve you. While there is no record to indicate that this particular agency was utilized, records do show that Mr. Dowler, in a letter dated December 20, 1906, contacted Mr. Robert Watchorn (Immigration, New York Harbor) stating that “we can use at least 100 men in mining coal here and pay the highest price in the region for labor and take good care of our men as we have very good houses and all the conveniences.” As the letter indicates, both the Possum Glory and Penn Mary coal companies probably utilized these types of agencies to recruit some of their workers. According to company records, “individual recruiters” were also utilized with much success. Often working alone, but sometimes accompanied by a person who could speak the native language of the workers being sought, the recruiter traveled throughout neighboring counties. Discreetly and quietly, these recruiters would make contact and contracts with prospective workers. Needless to say, coal companies in the areas visited by these recruiters took exception to their presence – if discovered, they were dealt with accordingly by the companies! Prospective workers were approached in a number of ways. Someone who might have just lost his job might be given a ticket to Heilwood along with the recruiter’s card, and told to “look up” the superintendent upon arrival. Others might have actually accompanied the recruiter, who would have paid for their transportation back to Heilwood with the promise of six weeks of work, and that their “travel expenses” would be forgiven. Additionally, some workers would be given tickets to Heilwood to simply “check out” the town and mines, and then “report” back to fellow miners. Upon arrival, these men would be met by friends of the company, who would speak highly of the mines and town and strongly influence the report that made its way back to the other prospective workers. Either by design or by chance, specific ethnic groups seem to have been designated for recruitment. Slavs, Poles and Hungarians were atop the list. Americans and other English-speaking workers were also recruited, though in lesser numbers.